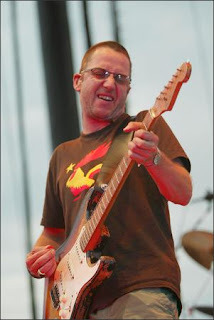 Stone Gossard is cool for many reasons. He has one of the coolest names, "Stone," that i can think of. He's rhythm guitar for Pearl Jam and wrote songs like Elderly Women and Daughter. And finally, he plays in Brad, which is fronted by Shawn Smith, and made some amazing records about 5-10 years ago. Here are a couple samples. Day Brings is my favorite. Unfortunately, Brad isn't huge on the Internet, so check out Secret Girl, Buttercup, and Screen among others. Finally, Stone Gossard popped into my mind because I saw this interview he did recently. Brad is getting back together and will be releasing a new album soon. Pretty cool. Brad is also playing at Webster Hall for a benefit, which Stone was promoting in the interview. Check it out.